I am really late getting these made and sent out. Luckily I had ordered the large playing cards months ago, and the idea I had was simple. The party is 2 weeks away, the Small Person has a school trip tomorrow, so the invites wont go out until Tuesday, and I've asked everyone to reply by Friday! Ooops! 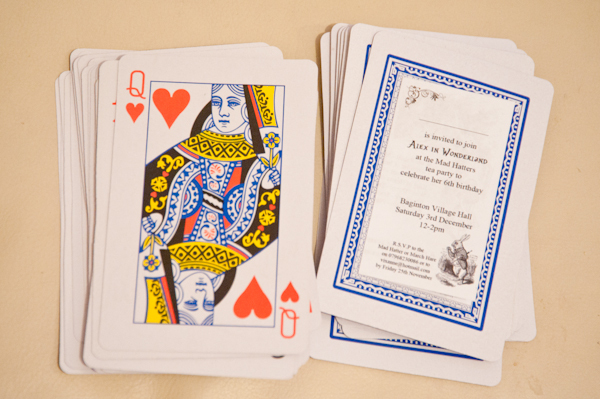 Each invitation is made using one oversized traditional style playing card. Front and back of playing card with pound coin to show size. The pictures are part of the collection of illustrations created by John Tenniel for the first editions of Alice's Adventures in Wonderland in 1865, and Through the Looking Glass and What Alice Found There in 1871. They are available here. 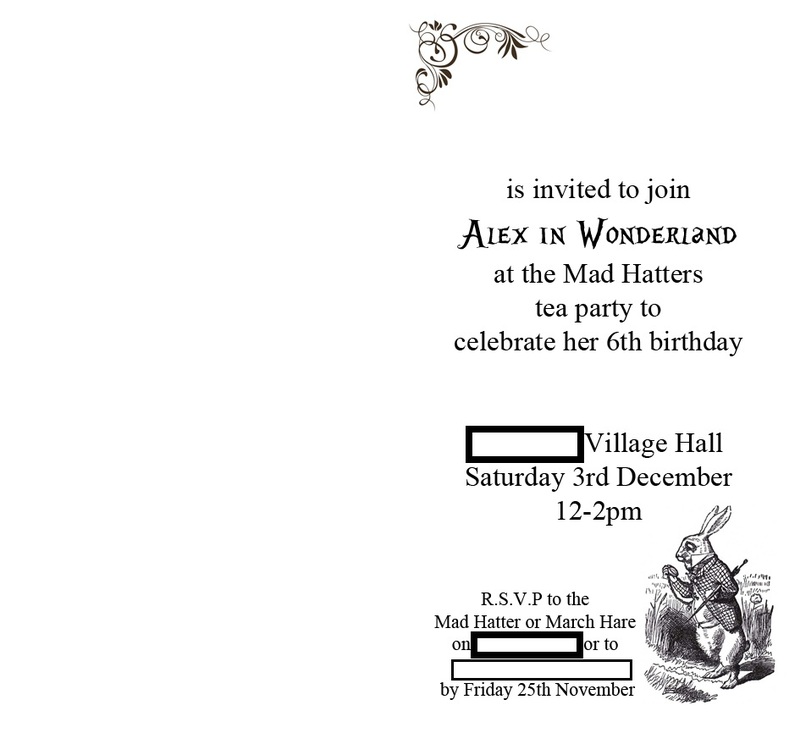 The actual printed part of the invitation was created in Photoshop by Mr Bogert according to my detailed (and apparantly illegible) instructions. It is printed as a mini bi-fold so that the main party details are on the front, and the fancy dress instructions and character list are inside. 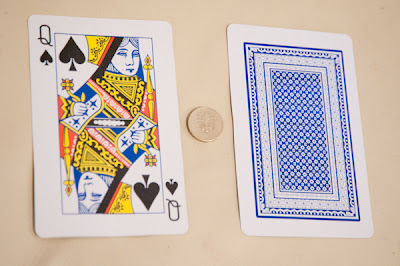 They were printed to a size that fits neatly in the centre of the card. The outside front of the printed design. 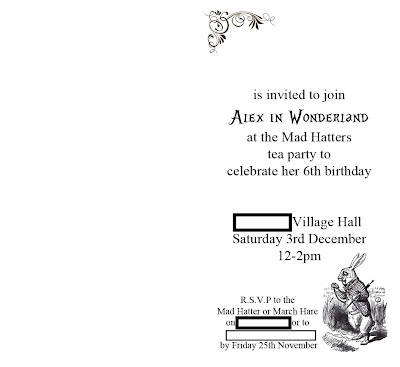 We used Times New Roman font for most of the text (as it resembles a book), and for a few choice parts we used an Alice in Wonderland font available here. The inside double page detailing the fancy dress part of the party. Once printed, I cut them using the guillotine, then folded each down the centre. Printed and cut. Left - inside double page (unfolded). 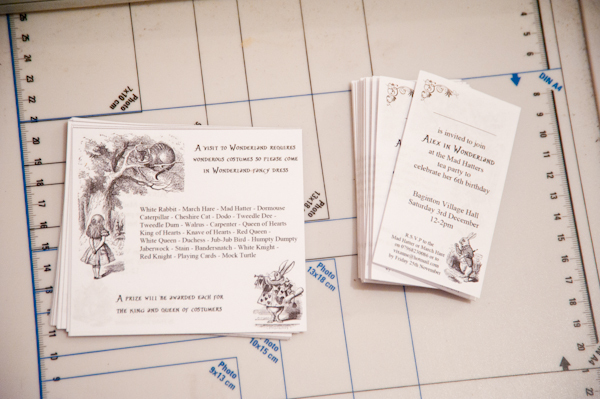 Right - front of folded invites. 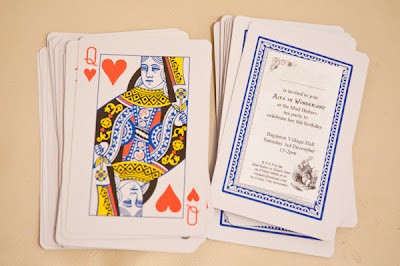 Using a glue stick, the printed part was glued to the back of the playing card although had I have had some, I would have used double sided tape (less messy, doesn't wrinkle the paper and is easy to line up). Being short on time, I really have kept this simple. If I had more time, I would have tea stained the paper first for an aged effect then matted it on black paper. Then I would have added a thin red satin ribbon tied around the centre of the whole card (and holding the printed flap closed), possibly with a card cut-out of the one of the suit symbols (hearts, diamonds, clubs, spades) threaded on with a couple of black and white beads. These will be sent to school, dancing and various other places frequented by the Small Person this tomorrow and Tuesday in plain 6x4 envelopes *EDIT - We have actually sent them into school in the playing card box they came in, with a label asking the teacher to please hand them out*. 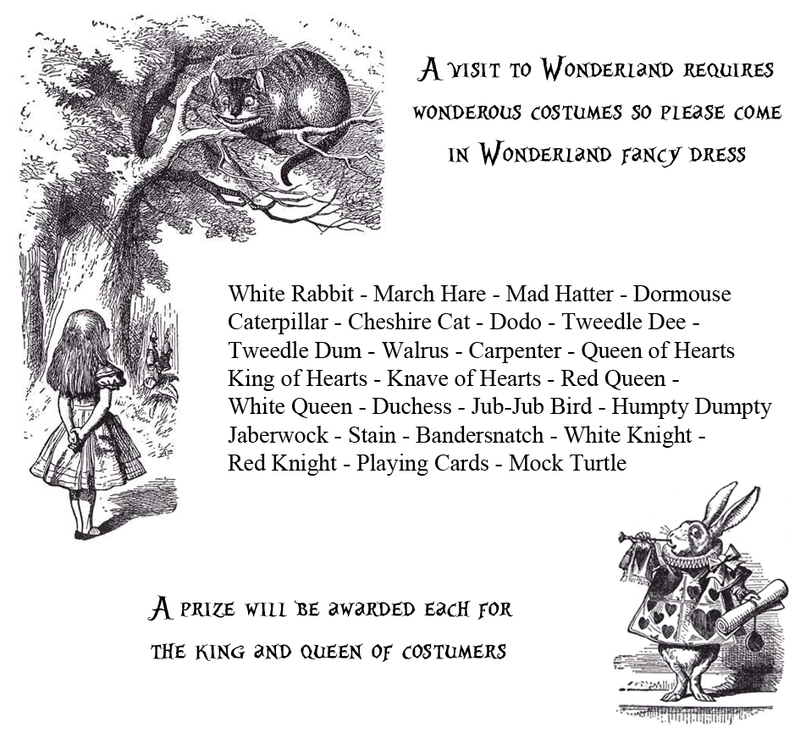 Again, having more time, I would have printed another Tenniel illustration on the front bottom corner of the envelope, and used a red heart sticker as an envelope seal. Fingers crossed we get the replies back in time! I must admit, I'm loving this party theme. 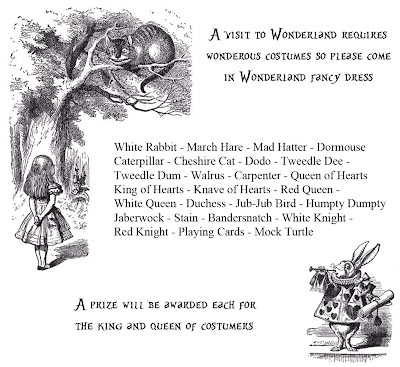 I'm kind of hoping we can re-visit wonderland when she's older, a "Alex Through the Looking Glass" kind of party (giant chess pieces, big mirrors, chequerboard dancefloor, my imagination is running away...). Just for me you understand. 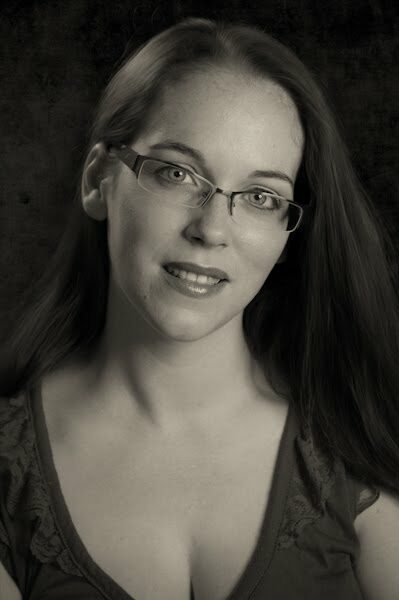 I'm kind of Mummy-selfish like that! You can see last year's Superhero invitations here, and the previous year's Pirate invitations here.